Jack Sparrow is probably one of the most famous pirates around, and now you can be too with this adult Prestige Captain Jack Sparrow costume! The shirt is 100% polyester and the blue vest, which is attached to the shirt, feels like felt and has a special black pattern that gives it a leather-like appearance. Two belts and a red and white sash are attached on the sides of the vest. The long coat is truly an authentic looking addition to the costume. The brown crop pants are polyester and have elastic bands in the waist and bottom cuffs for extra comfort. Also included is a leather-like captain’s hat. Brown, polyester boot tops also have a leather-like look and the final addition is a maroon bandana with fake, pirate dreads. 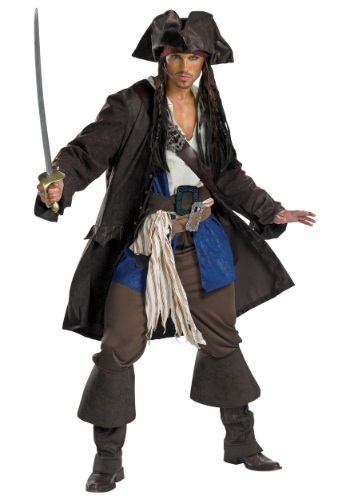 Set sail on the seven seas with this officially licensed Jack Sparrow costume!